Do you have an appreciation for beautiful blooms? Bellingrath Gardens should be a priority stop when traveling on Alabama’s Coastal Connection. 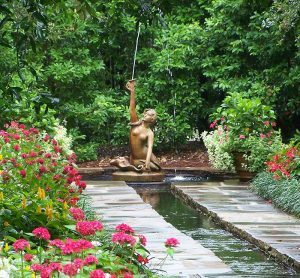 Set on a gorgeous Southern estate, Bellingrath boasts 65 acres of floral plumage 365 days a year, so there is never a bad time to stop in and smell the roses! The time of year you visit will determine the plant varieties you will observe. If you’re visiting in the spring, admire the award-winning rose garden and more than 250,000 vibrant azaleas. Summer yields beautiful tropicals, hydrangeas, and roses galore. The cascading chrysanthemums make their grand re-appearance in the gardens each fall, providing a truly magnificent sight to behold. And during winter, the gardens will be filled with the colors of the holidays, including bright poinsettias and winter berries. Another way to enjoy your time is to plan your visit around seasonal events at the gardens. Popular among families is the Easter Egg Hunt and Breakfast with the Bunny and the Wiggle Waggle 5k Race and 1 Mile Fun Run. Adults will love the Camellia Classic Car Show and Wonderful Wednesdays. In November and December, the gardens light up with festive lights and Christmas décor for Magic Christmas in Lights. More than 3 million lights and 1,100 set pieces bring the holiday spirit to the gardens! No matter the time of year, follow Alabama’s Coastal Connection to the lush colors of Bellingrath Gardens.